Some would say that an exclusive interview with the President of the United States, during one of the most controversial scandals to ever hit the White House, is the interview of a lifetime. Others would say interviewing Fidel Castro in the wake of unprecedented U.S. sanctions relief or the conversation with Pope John Paul II is the most significant. 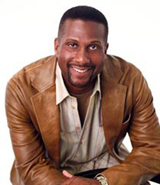 His late night television show, Tavis Smiley, is the first program in the history of PBS to broadcast from the West Coast. He also hosts The Smiley Report, heard daily on urban contemporary radio stations across America, and appears twice weekly on the Tom Joyner Morning Show. In addition, Smiley has an imprint (Smiley Books) with Hay House, creating a series of products including empowerment cards, audio cassettes, mini books and success seminars. He was previously the host of the award winning BET TONIGHT with Tavis Smiley, as well as The Tavis Smiley Show on NPR, where he was the first African American to host his own signature talk show in the history of National Public Radio. Smiley has written six books. His most recent, Keeping the Faith: Stories of Love, Courage, Healing and Hope from Black America, is an inspiring collection of personal narratives about love, loss and faith by African Americans from all walks of life. The mission of his nonprofit organization, the Tavis Smiley Foundation, is to enlighten, encourage and empower black youth. Tavis Smiley Presents, a subsidiary of The Smiley Group, Inc., brings ideas and people together through symposiums, seminars, forums and town hall meetings. His advocacy work has been profiled on 60 Minutes. Smiley is a graduate of Indiana University, and was previously a top aide to former Los Angeles mayor Tom Bradley. One of ten children, he is single and lives in Los Angeles. In his spare time, Smiley enjoys a good game of Scrabble with friends. In Keeping the Faith, nationally acclaimed author and commentator Tavis Smiley, host of NPR’s The Tavis Smiley Show, weaves stories of over one hundred African Americans into a rich tapestry of intimate testimonies about life, love, and inner strength. In Smiley’s affirming collection, black Americans from all walks of life join with well known figures such as Iyanla Vanzant, Cornel West, and Danny Glover to offer insights about the moments that challenged them to learn, the teachers who inspired them to grow, and the sources of hope and courage they draw on in their daily lives. Certain to be of abiding value to readers everywhere, Keeping the Faith offers rich lessons about loss and healing, wisdom and fulfillment, perseverance and the wellsprings of joy. Issuing a powerful call for constructive social action, the popular radio and television commentator Tavis Smiley has assembled the voices of leading African American artists, intellectuals, and politicians from Chuck D to Cornel West to Maxine Waters. How to Make Black America Better takes a pragmatic, solutions-oriented approach that includes Smiley’s own ten challenges to the African American community. From the man who catapulted The Covenant with Black America to number one on the New York Times bestseller list comes a searing memoir of poverty, ambition, pain, and atonement. Celebrated talk-show host Tavis Smiley describes growing up in an all-white rural community in Indiana and the impact it had on his life. Tavis Smiley grew up in a family of thirteen in a small trailer in Indiana, where money was scarce and the sight of other black faces even scarcer. One of only a few African American kids in his high school, he grew up feeling like an outsider because of the color of his skin, his Pentecostal religious beliefs, and his family’s economic circumstances. It was the love and support of his family that sustained him. But that trust and support was shattered when his father, in a moment of rage, beat him with an electrical cord, sending him to the hospital. Tavis was placed in foster care for a time, and it took him years to bridge the emotional chasm between him and his parents. An honest, deeply moving self-portrait of one of America’s most popular media figures, What I Know for Sure should appeal to readers everywhere.